Use Ginger’s professional translation software everywhere you write! Ginger Page helps you express yourself naturally with translation between more than 40 languages. Get Ginger Get Ginger for your Android! Communicate effectively with anyone, anywhere, anytime. Ginger Translate is free translation software that offers language translation between forty languages. This cutting-edge translation tool allows you to express yourself naturally in many languages including Spanish, French, German, Japanese, and many others. Using Ginger Translate is easy. Simply choose a language and input the text you’d like the translation tool to transform. You can use this language translation software to communicate with others or to improve your own English skills. Avoid making embarrassing translation mistakes with Ginger Translate. With this free translation software, you will find it is simple to express yourself naturally in the language of your choice. Free download with just a click. Download Ginger’s translation software for free. 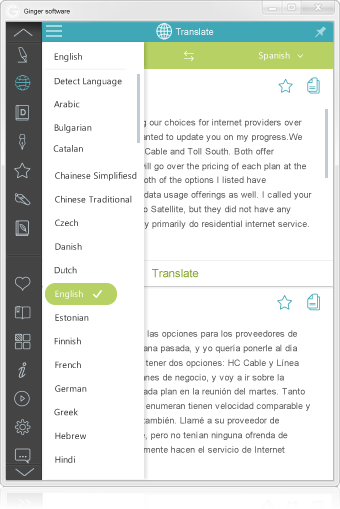 It’s fast and easy and you can start translating your text everywhere. English to German? French to Italian? Spanish to English? Ginger Translate has it all! With Translations between over 40 languages Ginger’s free translation software help you communicate with everyone, everywhere.